NOTE: (sorry for adding this so late) what matters is how you write digits in handwriting, and this needs to be included in your answer. Start with the first (left-most) number. Then: if the last number that you were on was odd, move left once (wrapping around to the right-most if you were on the left-most number), and if the last number that you were on was even, move right once (wrapping around to the left-most digit if you were on the right-most number). Note: see the next spoiler for a handwriting justification. When written out, 2, 3, 5, 7, and 9 end on a "free end". The number 2 ends with the pencil stroke going right, and left-leaning for 3, 5, 7, and 9. 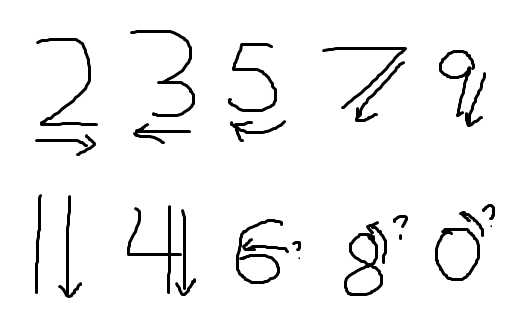 The reason why the other digits don't get represented are because the stroke ends for 1 and 4 by going down (without going left or right), and the stroke ends inside the digit for 6, 8, and 0 (which could make it a little ambiguous). There are only a few "effective" ways that this game can end. If all digits are even, you will continuously loop rightward. If all digits are odd, you will continuously loop leftward. Otherwise, you'll eventually reach a 2-cycle alternating between an odd and even number. If all of the numbers are odd, you alternate either from smallest to largest or from largest to smallest, based on the first number. If at least one of the numbers are even, you alternate the biggest and smallest number based on which one comes first. If you are given an even number of numbers, you alternate between the maximum and minimum numbers, based on which one comes first in the list of numbers. If you are given an odd number of numbers, you repeat the numbers from smallest to biggest based on the maximum and minimum numbers and where they come in the list. What's the problem in the following paragraph? Should the angels play their game? How can I win without knowing how to play? Next number in this sequence?